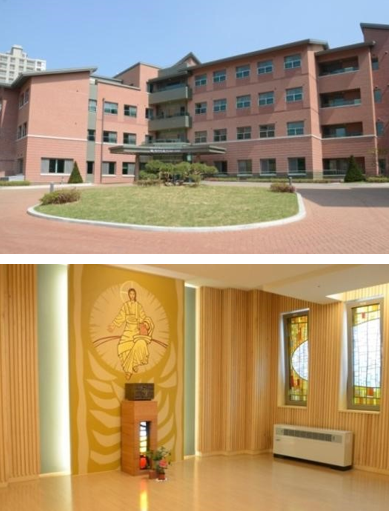 In the rising number of elders in the Korean society, the purpose to construct the Fatima Home was to serve the elders as Jesus and care them with respect and help them to live as human beings. employ and train staff to open the Home. Fatima Home is a 5 story building including the ground floor and could accommodate 75 residents. The Home is somewhat different from other nursing homes, for it has the concept of the “Home” for residents. The residents are supported to have regular everyday life, leisure life, health care service, faith life, family gathering, etc. Not only to support the basic everyday life, but to support to receive regular health care by a commissioned doctor and physical therapy, and any care service. For the leisure life the residents could attend the prayer meeting and choose to any of the classes such as the ceramic arts class, gardening art class, health promotion class, paper folding art class, cooking class, tea making class, skin care class, reflection of past program, etc. The residents are also helped to go out to visit families, relatives, friends, markets and shopping centers. The families of the residents can visit any time and can go out with residents; and the families can have events at the Home. We the sisters and the employees try to think and act in the point of residents view and make the residents to feel the Home as their own home and the House of God.